MINDAL set of bathroom floor furniture and Della Mirror. MINDAL AIR set of bathroom wall hung furniture and Eskada Mirror. MINDAL Cabinets – Soft Appealing Design. 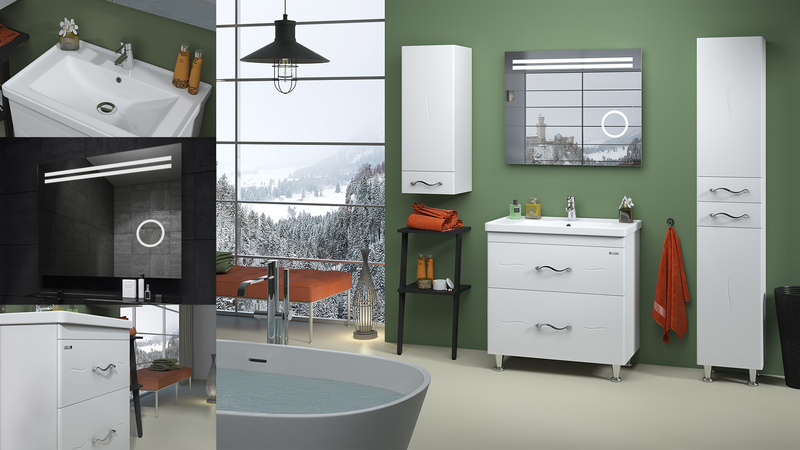 These MINDAL and MINDAL AIR models of bathroom furniture are provided in the two versions – the floor and the wall version respectively. This model features a 16 mm thick MDF and exclusive handles. Soft, pleasant and modern design. The concealed soft close Blum runner systems enable effortless use of furniture for years. Practical grey color inside the drawers, special construction for wall hung cabinet installation, Sayerlack painting materials (Italy), quality fittings and materials. 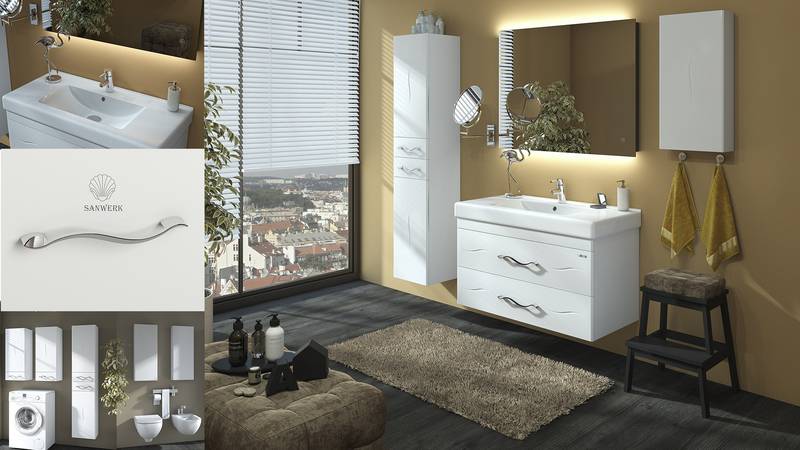 MINDAL and MINDAL AIR bathroom cabinets are completed with a ceramic wash basin (Kante or Prince). Kante wash basin goes with 600, 700, 800 mm wide cabinets. This is drop-in wash basin preventing spillage and dripping of the water. Prince wash basin is available for the dimensions of 900, 1000 mm. This wash basin stands out among the others thanks to its imposing and sophisticated look (it is 90 mm thick) as well as its utmost depth (180 mm). Width (under the wash basin): 600 mm, 700 mm, 800 mm, 900 mm, 1000 mm. Floor cabinet height: 850 mm. Wall hung cabinet height: 600 mm. Tall Cabinet width: 350 mm. Flooring Tall Cabinet height: 1900 mm. Wall Hung Tall Cabinet height: 1650 mm. Tall Cabinet depth: 300 mm. Ask us a question, and we will reply you back.